Your privacy is important & location data is valuable. Many apps can collect and sell your location data. They can often collect location data even when the app is in the background (not currently open). Always Share your location with the app even when the app is in the background. From the Home Screen tap the Settings icon, select Privacy & then find Location Settings. Go through each app, and mark either Never (if you’re not sure why the app needs your location), or While Using. Some apps can save you time by using your current location (Google Maps, Uber, etc). For those handfull of apps select "While Using". Do not select Always. There are very few reasons of an app to have access to your location while in the background. If the app really needs it, they can notify you when you're in the app. 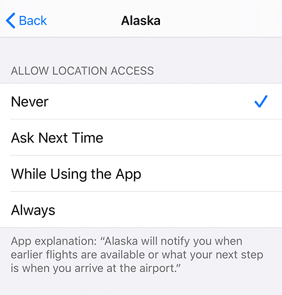 When you tap into an app, you'll see the explanation the developer has given to request for your location data. If it doesn't seem necessary, just mark it "Never".